As a society, we tend to be distanced from our food. For most of us, we do not see first-hand where our food comes from. Instead, we merely walk or drive to the nearest supermarket and fill up a cart. For people who lived in Nova Scotia long before grocery stores existed, or even agricultural techniques were commonplace, it was essential to know how and when to collect and store food. Foraging was an essential skill to their livelihoods. They had to know the perfect time of year to scour fields, trees and shrubs to harvest edible fruits, vegetables and medicinal plants. I first became interested in foraging late last summer, after I purchased my first mushroom field guide by George Barron. I am far from experienced, and mushrooms are an area of foraging where it is important to be knowledgeable. So I spent my winter reviewing my guide book, hoping to gather some black morels and chanterelles this season. 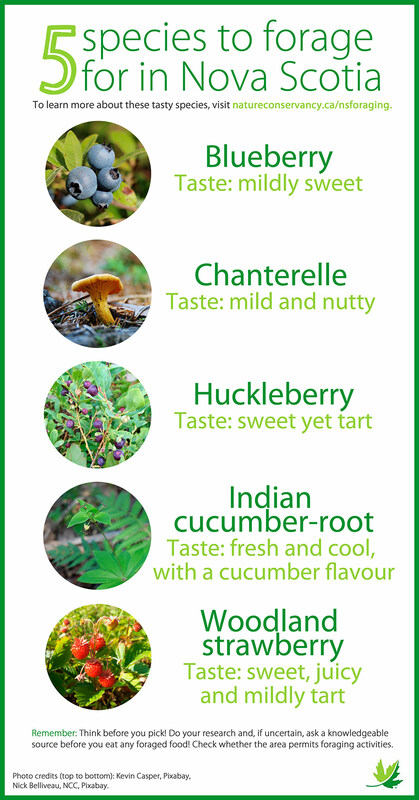 Though my interest started with mushrooms, I realized the foraging potential of our area when my aunt gave me a field guide on edible plants of Atlantic Canada for Christmas last year. Fiddleheads, for example, are one of Nova Scotia’s most well-known and widely enjoyed local foraged food. Also, there are countless native plants with tasty berries that are perfect for jam or a sweet dessert (I am patiently waiting for late summer for the blueberries and huckleberries to ripen!). 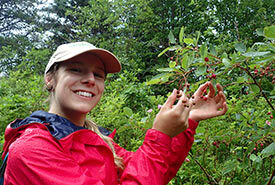 If you like a hot cup of tea with your dessert, you can head down to a bog and pick some Labrador tea. Even pesky invasive species can become tasty ingredients, with Japanese knotweed, dandelion and garlic mustard being edible examples. My internship with the Nature Conservancy of Canada has allowed me to spend many hours in forests and fields and along coasts. Between my supervisors, co-workers and my trusty guidebooks, I have been given the opportunity to discover the crisp, refreshing taste of Indian cucumber-root, the spearmint flavour of teaberry and the tartness of bog cranberries. There is an untapped world of tasty, local options that Mother Nature provides for us in our own backyard. 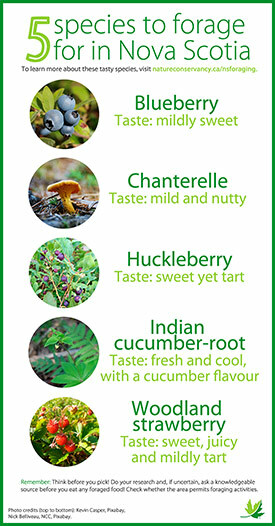 I may not be quite ready to forage my meals for the week, but hopefully over the course of my internship I will learn even more about the edible plants of Nova Scotia. When the time comes again to go grocery shopping, maybe we can all think a little differently about where our food comes from. 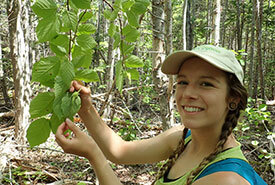 The Conservation Internship Program is funded in part by the Government of Canada’s Summer Work Experience program. 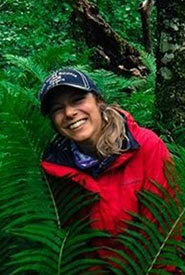 Haley MacDonald is a 2018 summer conservation intern with the Nature Conservancy of Canada in Nova Scotia. 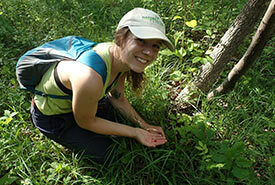 Read more about Haley MacDonald.